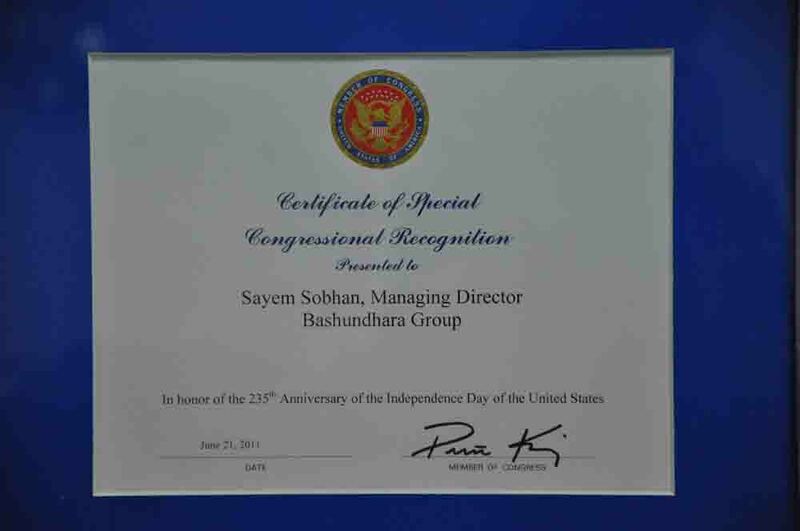 Managing Director of Bashundhara Group Sayem Sobhan and Chairman of East West Media Group Limited and Bangladesh Development Group Mustafa Kamal Mohiuddin have been awarded ‘US Congressional Recognition’ for their outstanding contribution to strengthening and upholding business ties between Bangladesh and the USA. Nicholas J Dean, Charge d’Affaires of the US embassy, handed over the ‘US Congressional Recognition’ certificates to them at a function marking the 235th anniversary of the Declaration of Independence of the USA in the city on Sunday. According to the citation, Sayem Sobhan and Mustafa Kamal Mohiuddin put in their best efforts to foster economic relationship between the two countries as “successful business leaders as well as entrepreneurs”. On behalf of Sayem Sobhan, Mustafizur Rahman, deputy managing director of Bashundhara Group, received the certificate. The Global Alliance for Homeland Security organised the event at Bashundhara Convention Centre-2. LGRD Minister Syed Ashraful Islam along with other guests cut a cake and addressed the programme as the chief guest, while Land Minister Rezaul Karim Hira and State Minister for Women and Children’s Affairs Shireen Sharmin Choudhury spoke as guests of honour. Mustafa Kamal Mohiuddin also addressed the function as special guest while Nicholas J Dean was the keynote speaker. Vice Chairman of the Global Alliance for Homeland Security Golam Mehraj delivered the welcome speech. The celebration was followed by a cultural programme.